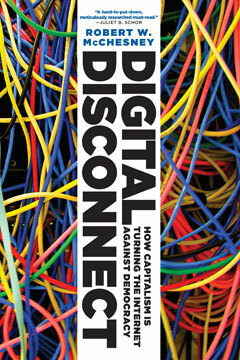 Hailed as “important” (Truthdig) and praised for its “excellent insight” (Patricia J. Williams, The Nation), Digital Disconnect skewers the assumption that a society drenched in information in a digital age is inherently a democratic one. “A provocative and far-reaching account of how capitalism has shaped the Internet in the United States” (Kirkus Reviews) and “an excellent analysis of the problem where a medium with the capacity to empower people is itself becoming a tool of social control” (Daily Kos), Digital Disconnect is both a groundbreaking critique of the Internet and an urgent call to reclaim the democratizing potential of the digital revolution while we still can. Amy Goodman interviews Robert McChesney on Democracy Now!